Seeing photos of granddaughter Alex, aged 16, taking a spin in a glider, heaved me back 60 plus years to my own gliding days. My dad became interested in gliding soon after the war, and it became a favorite family pastime. I camped out in primitive fashion, with my older brother and sister, John and Ann, at the Midland Gliding Club at the Long Mynd in Shropshire. It was a long hill that provided strong updrafts with a west wind. 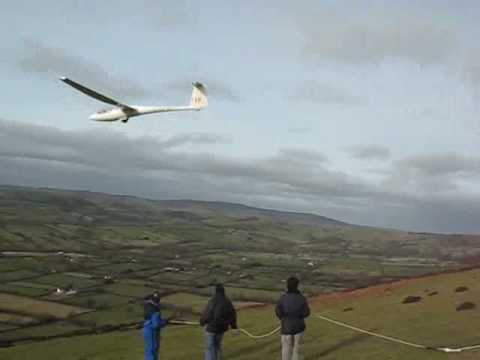 We launched by dragging the glider over the edge with bungee cords, or towed them with a motorized launch. Dad built and mended several of the winches, helping the in house engineer, Teddy Proll. Our main glider initially was the T21 open two 2 seater. Here are a recent google picture of a T21, and one of ours taken a very long time ago on Long Mynd. It was in that glider that I took my first solo flight, with a concrete block in the co-pilots seat. I remembered it as soon after my 14th birthday, but, like Alex, I was just sixteen. It was on June 23rd 1955, as shown in my log book (bottom line “P1”). There were/are certificates in gliding, grades A, B, C, Silver C and Gold C. I got as far as Silver, for which you/I had to stay aloft for 5 hours, gain over 5000 feet, and fly across country for 50 km (32 miles) and land (safely) among cows in someone’s field. Here is my certificate, the log of the height gain, and the tracing from the smoke-drum barometer to prove it. As mentioned, gliding was a family effort. We traveled some, with events at the Derbyshire and Lancashire club at Great Hucklow and at Lasham airfield in Berkshire. Dad and John competed in various national and world championships. Here we are at one event (John aboard, Dad with the pipe). And Happy Birthday, special son Andy, Alex’s dad! Previous: Previous post: I am still here….. I never knew! What hidden talent – I can imagine how you drove the family car… You have obviously taken after yout Dad with these dangerous sports. Played 36 holes at Royal Porthcawl on Wednesday. Walked 19 miles mostly looking for lost balls in tough rough. You would love it. What is coming next, I wonder? Wow – Peter, you are full of surprises. My father also was interested in gliders. Though he glided often from a place north of Atlanta when he worked at the CDC, he was never as accomplished as you or your family. I did go with him several times and was ground flight crew. It was awesome! I’ve just read out your post to my friend Andy ( ex pilot) who has visited Long Mynd for a week every year until a few years ago when he felt it was time for a change and turned his attention to sailing, Kayaking etc.. Andy lives right beside Loch Riddon in Argyll, next to Loch Striven where Barnes Noble tested his bouncing bombs. He was delighted to read your post.